Sony WH-CH700N review | What Hi-Fi? Wireless headphones are at that midway point in the season, where all the big hitters have shown their hand and the table is beginning to take shape. As it stands, Sony is on top. It makes our favourite wireless earbuds and its flagship on-ears are our current Product of the Year, so the arrival of the WH-CH700N, currently available for £100, is the source of no little excitement. A word on that pricing, though: our four-star rating is based on these Sonys being £100; for customers based in the US, where the WH-CH700Ns are retailing around the $200 mark, they don’t represent such value for money. Few companies but Sony can offer such an appealing set of features for this kind of money. The WH-CH700Ns offer wireless playback via Bluetooth with NFC pairing, active noise cancelling and up to 35 hours of battery life – with a ten minute charge sufficient to keep them going for an hour. The built-in microphone allows for hands-free calling, while there is Siri and Google Assistant compatibility for those who wish to talk to their tech. Sony’s Digital Sound Enhancement Engine (DSEE) is accessible via the Sony Headphones Connect App, alongside various soundfield modes and EQ settings, though in this instance we prefer to turn all of the extra processing off. 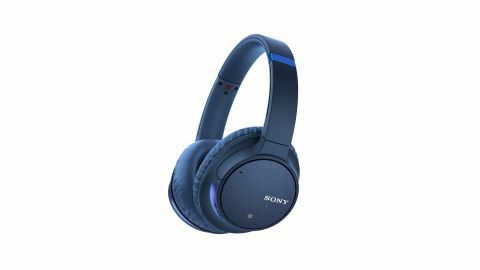 Available in black, blue or grey finishes, the WH-CH700Ns are typical of Sony’s smooth, understated aesthetic and sturdy build. They weigh only 240g, so you’re unlikely to notice them too much on your head. Our ears get a little warm during testing, but those padded ear cups make for a comfortable fit. Inside the WH-CH700Ns is a pair of 40mm neodymium drivers, and we’d certainly recommend a decent amount of running in time (you’re running in the amps as well as the drivers). They sound quite hard in the upper register straight from the box, but that calms considerably over time. After that, the balance is really quite even. There is emphasis put on the bass frequencies, but not enough to say it is inherently skewed. Moreover, Sony has managed to keep the low end relatively taut, while also providing plenty of punch, to avoid it sounding lazy. Timing is an issue to varying extents of all wireless headphones – even the WH-1000XM3 at around three times the price aren’t perfect in absolute terms – but it’s good enough here, and organisation is decent enough to make for a pleasurable listen. Dynamic expectations should also be tempered when testing wireless noise cancellers at this price, but the WH-CH700Ns make a decent fist of it, keeping the music interesting with impetus. Rhythmically, they’re pleasingly adept, musical enough to convey the intensity of a track and energetic enough to have us moving our feet. Their overall character isn’t exceedingly rich, but it isn’t brittle either. Vocal lines don’t possess the body or warmth you might expect further up the chain, and even once free of its harshness the treble doesn’t quite soar. However, the WH-CH700Ns remain an easy listen with just enough weight and detail across the frequency band to offer better than passable sonic insight. But these WH-CH700Ns stop just short of being exceptional. To earn five stars, they would need a surer sense of timing, and marginal upturns generally across the board. If noise cancelling is a major priority, you might need to consider spending more. It makes a difference when it’s turned on, but it definitely isn’t as effective as some. It’s more a case of noise quietening than cancelling. If you are considering the WH-CH700Ns as a solution for everyday, general use - something for your Spotify playlists on the morning commute - then they’re certainly capable of that. For a more sophisticated performance with these kind of specs, though, your best option seems to be spending a few more pounds.